The Prachuap Khiri Khan Province of Thailand, some 285 kilometers South West of Bangkok, is known for its historical attractions and beach destinations. The most popular district of the eight districts of Prachuap Khiri Khan is the Hua Hin. North of Hua Hin is another unspoiled beach, the beach of Cha-Am in Phetchaburi province. The two beaches are said to be the most beautiful in the area. Getting to Hua Hin/Cha-Am is easy. The Hua Hin and Cha-Am beaches can be easily reached by train, buses and minibuses leaving from Bangkok. The minibuses travel faster than buses and the fare is only slightly higher than bus fare. Of course, you can always take a taxi if you’re prepared to pay more than what you’ll be spending on a bus journey, but even though taxis in Thailand are required to use meters, it is not strictly followed, so you should be prepared to negotiate a price with the driver before taking the ride. The price is just a little less than what you would pay for an airfare, so it’s probably best to just take an airplane if you’re willing to spend anyway. By Bus. The Southern Bus Terminal in Bangkok leaves for Hua Hin every 30 minutes. The first trip is at 5:00 A.M and the last trip is at 10:00 P.M. The main road from Bangkok splits at Cha-Am and continues up to Hua Hin. The Hua Hin is only 25 kilometers South of Cha-Am and travel time takes about 3 and a half hours to 4 hours including traffic. By Minibus. In the heart of Bangkok, just off the Victory Monument at the left side of the Century Shopping Center, minibuses depart for Hua Hin daily. Buses leave every 30 minutes or as soon as it is full, with the first trip at 6:00 A.M. and the last trip at 7:00 P.M. Travel time takes about 2 to 3 hours. By Train. All trains heading South from Bangkok (Hualamphong Bangkok Railway Station) have several trips daily and stop at Hua Hin Railway Station. A few trains also stop at Cha-Am. Both trains take approximately 4, sometimes 6 hours to get to Hua Hin and Cha-Am. By Taxi. Travel time is about 3 hours from Suvarnabhumi Airport. The Highway Number 35 has the shortest route through Samut Sakhon and Samut Songkhran. Exit on Highway 4 and left on Cha-Am town. The Hua Hin is further South along the same road. By Plane. There are several daily trips from Suvarnabhumi Airport to Hua Hin Airport. 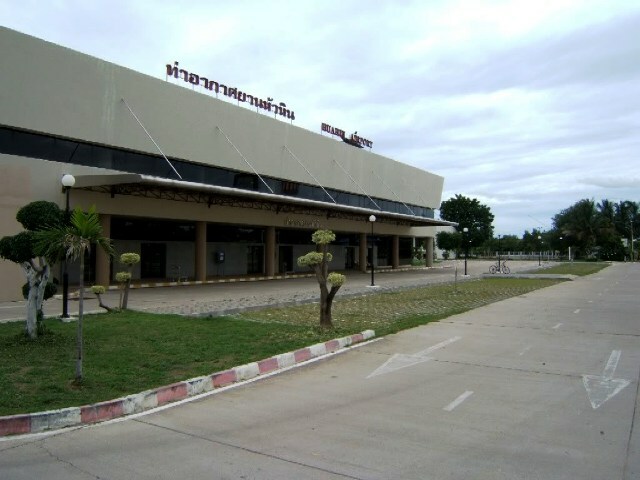 The trip only takes roughly 30 to 50 minutes and the Hua Hin airport is only 6 kilometers outside of the town center. Getting to Hua Hin/Cha-Am by air is no longer possible from Kho Samui and Phuket. The Bangkok Airways stop flying to Hua Hin Airport. There are buses and ferries though that can take you to Hua Hin and Cha-Am. The trip requires a combination of ferry and train, and ferry and bus. The trip also takes about 9 hours and thus make it an impractical choice. Flying to Bangkok first before flying or traveling by road to Hua Hin and Cha-Am is your best option if you want to save time. However, if you’re up to the long journey, you could always ask tour companies to make the travel arrangements for you.